A Bartlett Lecturer in Economics and Finance of the Built Environment has been awarded the 2018 World Sustainability Award for his work on climate change economics and sustainability. 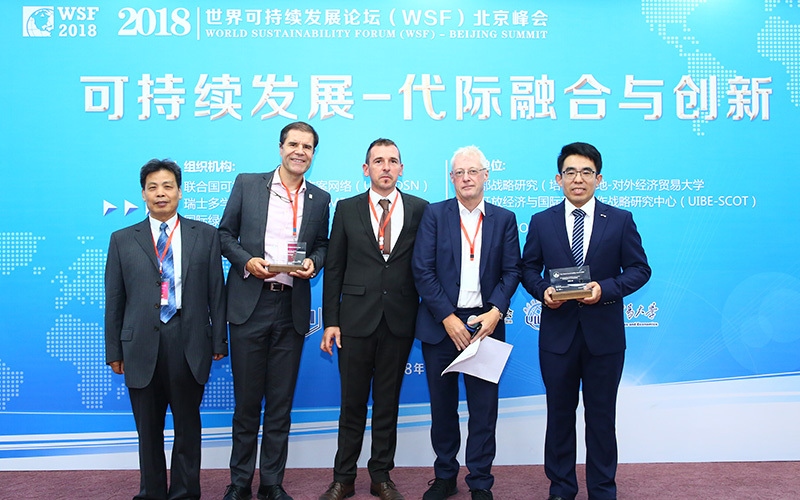 Dr Zhifu Mi, Lecturer in Economics and Finance of the Built Environment at The Bartlett School of Construction and Project Management, has been presented with the prestigious 2018 World Sustainability Award on 20 September at the World Sustainability Forum in Beijing. The award recognises Dr Mi's work on climate change economics and sustainability, particularly the methodologies and applications of carbon footprint. Dr Mi’s research focuses on the economics of climate change. His work on carbon footprint aims to track carbon emissions along interregional trade routes, helping to address the challenge of carbon leakage – in which an emissions reduction in one region results in an increase in carbon emissions in another. Consumption-based carbon emission accounting. Most current emission inventories ae taken at the point of production. Zhifu’s work considers the methodologies and applications of consumption-based emission accounting, in which all emissions occurring along the chains of production and distribution are allocated to the final consumers of products. Sharing economies as a pathway to sustainable societies. In collaboration with Professor D’Maris Coffman, Zhifu’s research explores a new business model for a sharing economy in which public authorities, enterprises and consumers can collaborate to achieve environmental and societal benefits. “I am very excited to receive the World Sustainability Award. My research focuses on climate change economics which is highly relevant to the UN Sustainable Development Goals including Sustainable Cities and Communities and Climate Action. Thank you to the School and Prof D’ Maris Coffman for supporting my research on sustainability in the built environment." The World Sustainability Award was established by the MDPI Sustainability Foundation, who are committed to supporting societally relevant research that contributes to regional and global efforts toward a sustainable world. The award is given to individuals or groups whose work has made a unique and outstanding academic or societal contribution to sustainability. The recipient can be nominated by anyone from the international research community and a winner is chosen by a selection committee. The award includes a monetary prize of $100,000 which this year is shared with co-awardee Mathis Wackernagel, co-creator of the Ecological Footprint and President of Global Footprint Network. This is the second time the awards have been held; 2017's joint winners are Prof Jeffrey D Sachs and Dr Sonia Ehrlich Sachs. Dr Zhifu Mi is a Lecturer at The Bartlett School of Construction and Project Management, with research interests in the area of climate change economics and energy policy. He has published over 40 papers in peer-reviewed journals, including Nature Communications and serves as an associate editor of the Journal of Cleaner Production and as guest editor of the Applied Energy journal. Since joining the School in 2017 Zhifu has won several early career prizes and best reviewer awards. In 2017, Dr Mi was awarded the leading Chinese economics award for his doctoral research - the National Economics Foundation award for Outstanding Doctoral Thesis on Economics Research in China. The School's research on sustainability addresses aspects of environmental, social and economic sustainability - from the psychology of pro-environmental behaviour to smart cities to sustainable development.